Researchers from Sultan Qaboos University in Oman, Johannes Gutenberg-Universität Mainz in Germany and Nanyang Technological University in Singapore have experimentally demonstrated a breakthrough in one of the major problems blocking the adoption of magnetic domain wall memory. When recording each fresh bit of information onto a racetrack, there is considerable uncertainty about where each magnetic domain starts and ends, and an incorrectly-written bit can easily lead to the corruption of bits. The team, led by Professor Rachid Sbiaa of Sultan Qaboos University, devised a method to overcome this difficulty by using a staggered nanowire (see figure below). Researchers from Japan's Tohoku University have developed a nonvolatile microcontroller unit (MCU) which achieves both high performance and ultra-low power by utilizing spintronics-based VLSI design technology and STT-MRAM memory. The researchers used several new techniques to create an efficient and fast device. Each module's power supply is controlled independently, which eliminates wasteful power consumption, while a memory controller and a reconfigurable accelerator module are used to relax data transfer bottlenecks. These new techniques enabled the researchers to achieve ultra-lower power consumptioN (47.14 uW) at 200Mhz. Researchers from the University of Minnesota have managed to deposit Bismuth Selenide (Bi2Se3) films using a simple sputtering technique. 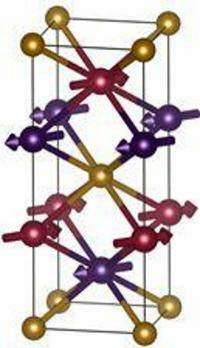 Bismuth Selenide is topological insulator and a promising material for spintronics applications including MRAM devices. The material produced in this research featured a high spin torque at room temperatures. 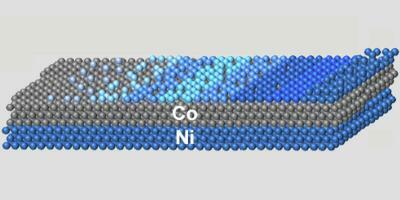 Researchers from the University of Lorraine in France report that following a comprehensive characterization of multilayers of cobalt (Co) and nickel (Ni), the material holds great promise for memory applications based on spin transfer torque (STT-MRAM). It was already shown before that Co/Ni multilayers have very good properties for spintronics applications, but up until now it wasn't clear if the films have a sufficiently large intrinsic spin polarization, which is necessary to create and maintain spin-polarized currents in spintronic devices. It was now shown that the films have a spin polarization of about 90% - which is similar to the best spintronic materials. Researchers from the NIST in the US and the University of Tokyo have discovered a metallic antiferromagnet (Mn3Sn) that exhibits a large magneto-optic Kerr (MOKE) effect, despite a vanishingly small net magnetization at room temperature. Compared to ferromagnetic materials, metallic antiferromagnets allow for faster dynamics and more densely packed spintronic devices due to the weak interactions between antiferromagnetic cells. 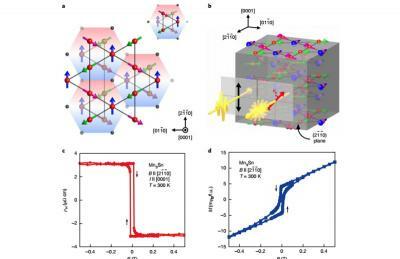 The researchers believe that such materials hold promise for future antiferromagnetic spintronic devices, where the magnetic state could transduced optically and switched either optically or by applying current.